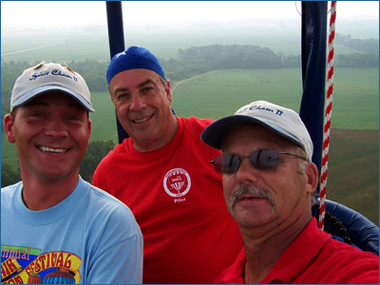 The Heart of Dixie Balloon Club was founded to bring together crews of Alabama balloonist in 1984, and since has grown to cover all of Alabama, portions of Tennessee, and Georgia. The membership of the club is comprised of local balloon crews, pilots and citizens who are interested in the sport of hot-air ballooning. Membership is open, so people from all walks of life can join and become a part of the ballooning experience! If you are interested in becoming a member or just want more inforamation please fill out our membership application. Each year the club hosts several events to socialize with other pilots and crew and to learn more as aviators. Annually there are two scheduled events and others are added as the membership decides. In February of each year the Heart of Dixie Balloon Clubs hosts a 'Cheap Seats Safety Seminar' as part of our mission to provide continuing education to our pilots and crew. Similar seminars often span over several days and can cost several hundred dollars. We provide our pilots with an affordable option by hosting the seminar over one long day and charging only a small fee. It helps to keep cost down by requiring all attendees to bring their own chairs! Each year the Heart of Dixie Balloon Club hosts a Christmas party at a members residence to celebrate the holidays and get together with our ballooning friends.